I've been under-seasoning lately, which I believe is a symptom of decreased confidence in general. Not entirely sure what that's about - perhaps pure winter exhaustion with everyone clawing through the last few days before spring officially begins, the cumulative effect of moving home, adjusting to shared living again after so many years of self-indulgent aloneness, erosion by an active lifestyle... who knows. The point is, could I use salt to push my self-esteem back up? After all, they say that rather than feeling good making you smile, smiling can make you feel good, firing the right neurons in your brain. I shall use condiments as a reverse-psychology tactic from hereon in. 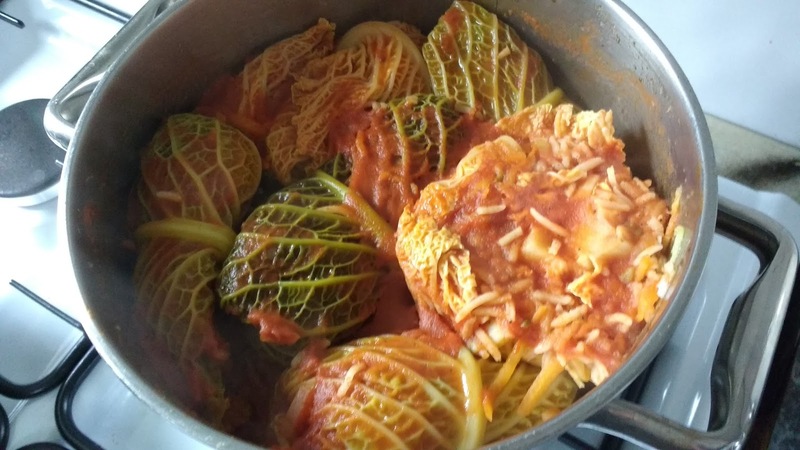 This first attempt at making a version of my mum's stuffed cabbage recipe therefore fell short this time, due to my current meek state of mind, but I'm still keen to share it because, with a little adjustment, this dish could be a knockout. I used all those loose, single, seemingly uninspiring vegetables left in the drawer, having consumed all the bright green and easily stir-friable ones. So here I had one hefty swede, two slightly softening courgettes and three carrots, not forgetting a lovely invulnerable savoy cabbage. The recipe, digging into the far reaches of my childhood memories, is labour intensive, but having broken it down in my head, it didn't seem too daunting. In general I find cooking very meditative and reflective. Stick the radio on and you're singing an embarrassing version of whatever's playing, fully immersed in the craft. Chance declared my stuffed cabbage was to be vegan - a healthy, nourishing and satisfying main. Not a bad thing. First, I cooked some rice, with quick-fried cayenne, cumin, cinnamon (bark or powder) and paprika, and of course salt - rice isn't my problem area. Using a food processor - a lifelong dream finally realised now I have a kitchen big enough for appliances! - I grated the swede, courgettes and carrots. These were then blanched in boiling water for a few moments, drained well, and mixed into the cooked rice. Also mixed in is a can of chickpeas. I covered the bowl of rice mixture with a towel and left it to steam and fluff up. While that's going on, the cabbage can be steamed in a pot, but not too long, just until the leaves are bright green and slightly more malleable than their usual crunchy self. Once done, it can be rinsed in cold water and the leaves are separated and left on a kitchen towel to dry. Leaving cabbage and rice to do their thing, I chopped an onion, some garlic and ginger, softened them in a large pot, with salt, pepper and some chilli flakes - fresh chilli is great of course - then added some tomato paste, a couple of cans of chopped tomatoes (a large bottle of passata would work instead, or as well as) and an equivalent amount of liquid - I used water, although stock would surely be better. I then threw in a bunch of fresh coriander stalks I had in the fridge too. Then seasoned again. Here is where my seasoning senses have failed me. I don't know what it is, but tomato sauce simply throws me - I panic about over-salting but somehow loads is required to allow the sauce to taste of anything other than tinned tomatoes. I pull back and miss the opportunity to make the thing zing. My advice is - go liberal, be bold, more liquid can be added in the event of overenthusiastic shaking of the mill! Now leave the sauce to bubble slowly and reduce for a good 20 minutes, or as long as it takes to carry out the next stage - the stuffing of the cabbage. I found this process pleasant and satisfying, but I would advise to be less utensil-stingy than me, and have a tray ready to place the rolled pieces on, rather than thinking 'what, another item to wash? Another item on the drying rack?... Pah, I'm a maverick and an artist, I'll just make do with the narrow board I've already used' and suchlike idiotic rationalisations. The pile of dolma I formed resembled an over-ambitious game of Jenga. A handful of rice mixture goes into each leaf, which is then rolled once, folded in from both sides, then rolled again. Once all the leaves are done (and I am left with an enormous amount of leftover rice mixture which I shall be freezing as part of my 'never again buy lunch ok maybe once in a while on a Fri when I fancy something from the food market around the corner, after all I am a civilised first-worlder why should I deprive myself of luxury when nobody else does' campaign), place them CAREFULLY and in an organised fashion into the gently bubbling reduced sauce, squeezing them down slightly as the layers amass, so that the sauce rises to cover them all.